New Delhi, N ov. 10: Former Supreme Court judge Ruma Pal today tore into the process of appointment of judges to the Supreme Court and the high courts and the lack of an embedded mechanism to ensure judicial accountability. Pal, a widely respected jurist not known to mince words, chose to put a caveat to her words: she was speaking from the “safe haven of retirement”. “The process of appointment of judges to the superior courts was possibly the best kept secret of the country,” she said. Judges’ appointments are now initiated and cleared by a collegium of the four senior-most judges and the Chief Justice of India for the Supreme Court and three senior judges and the chief justice for a high court. Since 1993, the executive’s role has been to dutifully appoint those cleared by the collegium. The executive can return the names but has to appoint the judges if the collegium clears the list again. 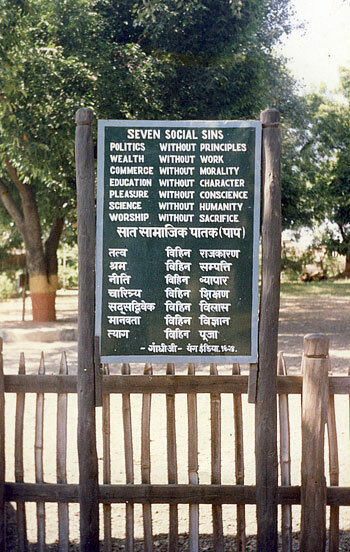 Seven Sins accounted by Gandhi Ji. An indiscreet comment or a chance rumour was enough to rule out a person’s perceived suitability for the post, she said. Friendships and obligations also sometimes colour recommendations, she added. Consensus in the collegium is often arrived at by “trade-offs”, she said, with “disastrous effects”. Pal also lamented the growing “sycophancy” and “lobbying” which colour these appointments. Pal was delivering the fifth V.M. Tarkunde memorial lecture here. Tarkunde, considered the father of the human rights movement in the country, was a lawyer in the Bombay Bar. He became a high court judge but later gave up the post to don black robes again. This brings me to the seventh and final sin of nepotism or what the oath of office calls “favour” and “affection”. What is required of a judge is a degree of aloofness and reclusiveness not only vis-à-vis litigants but also vis-à-vis lawyers. Litigants include the executive. Injudicious conduct includes known examples such as judges using a guesthouse of a private company or a public sector undertaking for a holiday or accepting benefits like the allocation of land from the discretionary quota of a chief minister. I can only emphasise again that nothing destroys a judge’s credibility more than a perception that he/she decides according to closeness to one of the parties to the litigation or what has come to be described in the corridors of courts as “face value”. This entry was posted in Contempt, Hall of shame, Law and Justice and tagged Cardinal Sins, Chief Justice of India, Corruption, Judicail Appointment, judiciary, Precedent, Ruma Pal, Seven Sins, stare decisis, Supreme Court, V. M. Tarkunde. Bookmark the permalink.